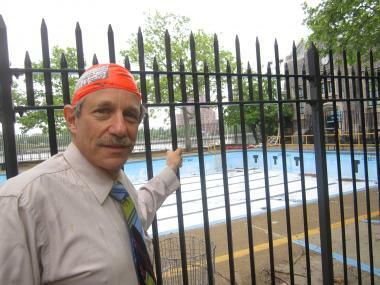 John Steinberg believes the city's public pools would be cleaner if swim caps were mandated. YORKVILLE — When John Steinberg was swimming laps last summer at John Jay Park's outdoor pool, he noticed a nasty clump of hair float past him at the leafy Yorkville park. But rather than recoil in disgust, the 62-year-old scooped it out and put it in a plastic baggie, sending the evidence along with a letter to Parks Commissioner Adrian Benepe urging the agency to take action. When Steinberg swims — which he does three times a week during the summer season — he always wears a swim cap. Now, he's on a mission to make sure other pool-goers do, too, claiming the swim space suffers from poor hygiene. "The issue of hair in the pool is the most revolting," Steinberg, who's been swimming at the space for more than a decade, wrote to Benepe in July, calling for a mandatory swim-cap policy. "I do not accept that city facilities must be second rate or in the worst case approach third-world hygiene. "The caps cost $2 a piece," the letter continued. "You could sell them or have the concessionaires sell them or you could give them away to the poor children. I even told your managers that I'd try to get a grant for you to defray some of the expense." The Parks Department didn't foresee any changes to the swim cap rule "in the immediate future," Benepe wrote to Steinberg in October. "The water is routinely tested, and the facilities are inspected and monitored to the health code standards," Benepe added. Many private pools require swim caps, such as the Flushing Meadows-Corona Park Aquatic Center and the Sports Center at Chelsea Piers. Public pools, however, do not mandate caps under city health codes. John Jay's pool received nearly 46,000 visitors last summer, according to the Parks Department, and the agency doesn't want a swim-cap policy to act as a deterrent. "A bathing cap requirement may discourage potential swimmers from using the pools, especially on hot days when a cool public pool is the best means of relief against the heat," a Parks Department spokesman told DNAinfo. Former New York City Parks Commissioner Henry Stern, who lives a few blocks from the John Jay pool and used to swim there regularly, didn't recall the pool being dirty. He also suggested that requiring swim caps could cause more trouble. "A bully might take a kid's cap and toss it back and forth," he offered. "You shouldn't have to worry about it." The 145-foot-long John Jay Park pool, is "one of the treasures of the city," Stern added. It was built by Robert Moses in 1939, as one of the Work Projects Administration pools and put in Yorkville as a favor to Robert Wagner, who represented that area as a state assemblyman before he became mayor, he explained. "It's a very special location," he said of the park overlooking the East River at East 78th Street. "The beautiful breeze comes in. … It's probably the most beautiful setting of any pool, certainly in Manhattan." Steinberg, too, soaked in the pool's beauty. "You take a lap and look up and see trees," he said. "It's delightful — but filthy." Despite meeting resistance from Parks Department officials — one emailed him saying swim caps were not feasible — Steinberg remains undeterred, and recently attended a local community board meeting trying to enlist neighborhood support. "The pool is way beyond capacity and the filter works overtime," Steinberg said. "There's no reason this pool can't be as clean as every private pool in New York." Even the Central Park Zoo's pool for seals appeared to have cleaner water, he told the board. "To say this is not feasible is to say that bodies don't float," Steinberg said. The city's outdoor pool season begins June 28.